Happy September! Cal here for Tuesday Stretch. Tonight I’m going to share some of my finds from our summer travels. We took a very indirect route to the Stretch Glass Society and Fenton Club Conventions, stopping to visit Steve & Gary and their iridescent glass in CT, then to visit friends in Maine before relaxing for three weeks in Provincetown on Cape Cod. From Cape Cod we traveled through CT and NY en route to a visit with Tom & Sandy in PA and Paul in Cleveland. With 5 weeks of ‘vacation’ under our belt, we headed south to Marietta for the conventions. Along the way we made some purchases which I’ll share with you another time, but tonight let’s take a look at a few of our acquisitions in the Marietta area. Soon after we arrived we had the opportunity to acquire these Fenton Cut Ovals candleholders. They are the 8.5” tall ones. 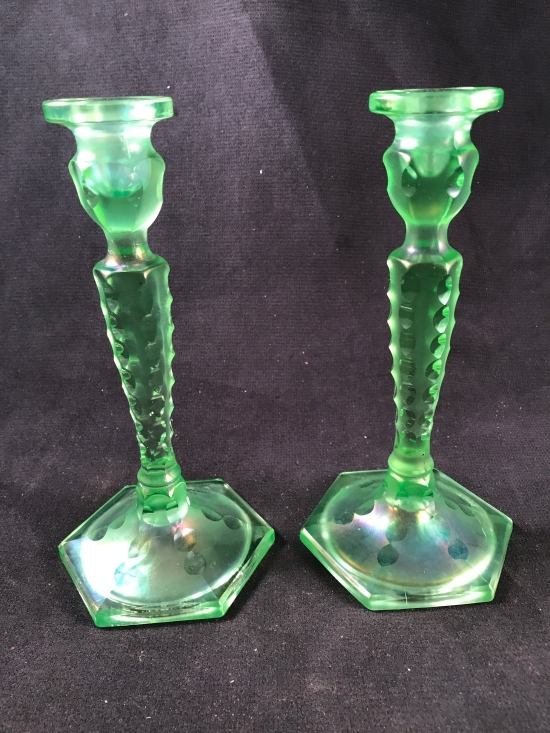 Florentine Green was the missing color in our collection of the #449 Cut Ovals Candleholders; we are continuing to search for a single #449 in Topaz stretch (or a pair, if we find those first, if you have a spare one, I’d love to hear from you. 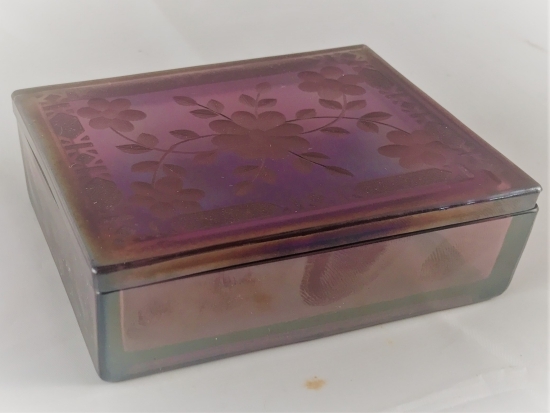 This Fenton Wisteria stretch glass cigarette box with acid etching was also for sale in one of the rooms at the convention hotel so we purchased it to go with our Wisteria cigarette holder. Now we just need to find an ashtray with inserts! All our purchases were not stretch glass. At “the park” in Williamstown, WV several folks were set up with Fenton and other glass for sale. 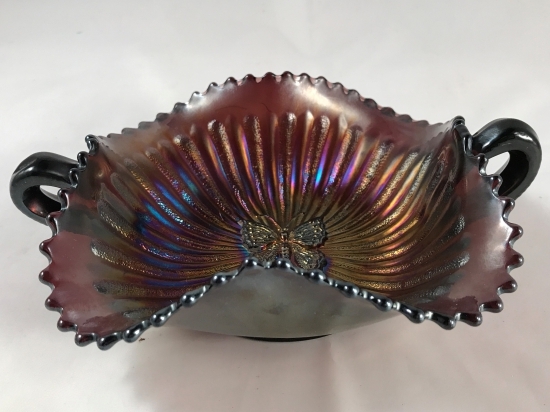 I spotted two items in Cobalt Blue carnival glass along with a Northwood butterfly bon bon in amethyst and decided to take them home – I really like Cobalt Blue glass, in general, and have other pieces of carnival glass in this color. I suspect these are common pieces to most of you who are reading this, but I thought I would share them and confirm that I have indeed picked up “the carnival bug” as a result of hanging around with you folks at conventions and virtually through this discussion board. Even though Diamond didn’t always have ‘good’ stretchy iridescence on their items from the stretch period, we love their iridized glass just the same. 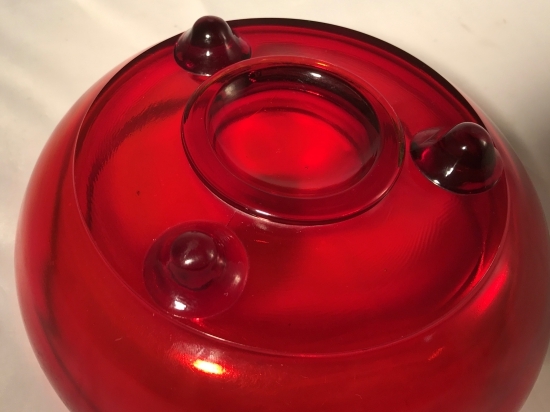 They made a line called “Ruby Lustre” which is as shiny as can be, but because it was made during the early stretch glass era, it is included in our definition of stretch glass. 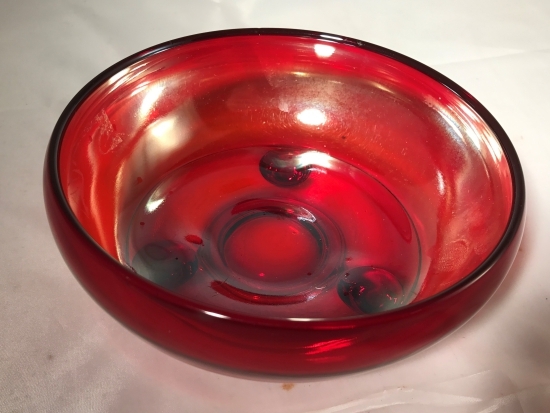 Here is a bowl; one might even call it a ferner, in their Ruby Lustre. Note the moulded feet. These feet have been found on Egyptian Lustre items, so we know they belong to Diamond. 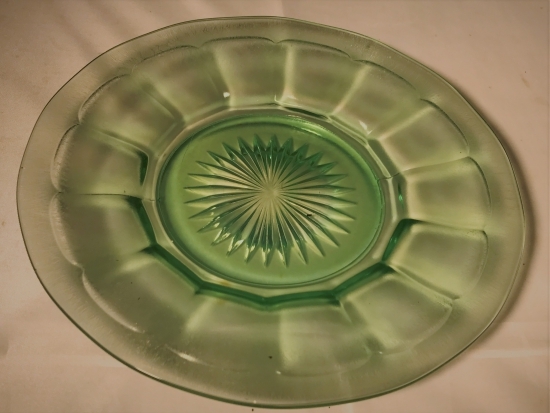 We would see a lot of Fenton glass during our stay in Marietta, but other stretch glass was offered for sale, too. We were able to pick up this green plate attributed to Imperial. The color is unusual for Imperial and not very many of these plates are known. I was happy to buy two from a seller who had acquired a set of 6 on eBay. The final item I’m sharing tonight is also an unusual piece of iridized glass. This one was made by Heisey and is marked with the Heisey diamond. I’m not a Heisey glass collector and do not know a great deal about their glass, but apparently they did not make a lot of iridized items. 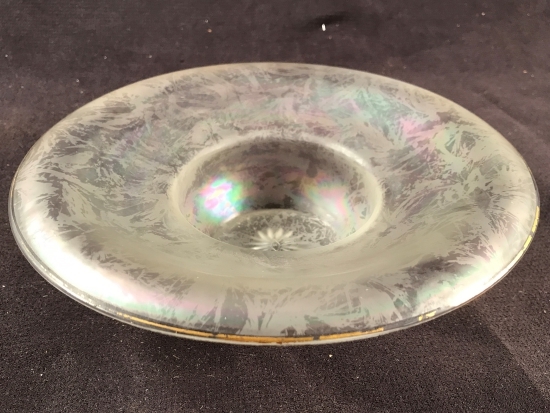 I’ve heard that some Heisey “experts” are of the opinion that Heisey did not iridize any of their glass and that any of their iridized glass resulted from one or more decorating shop applying the iridescence after the item left Heisey. 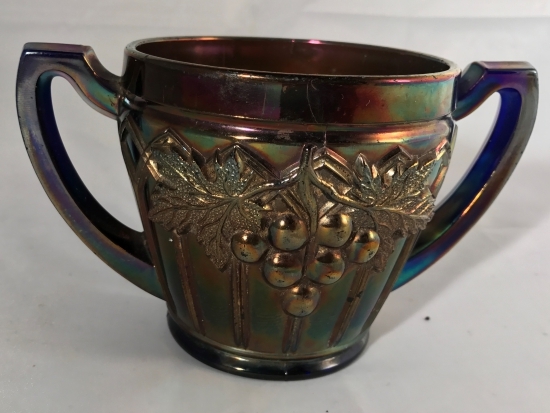 While it is true this iridescence appears to be “cold applied” iridescence, rather than the iridescence to which we are accustomed (which was applied while the glass was hot), there seems to be at least some evidence of iridescence being applied at and by Heisey. I’ll leave that debate for the Heisey experts to work out. 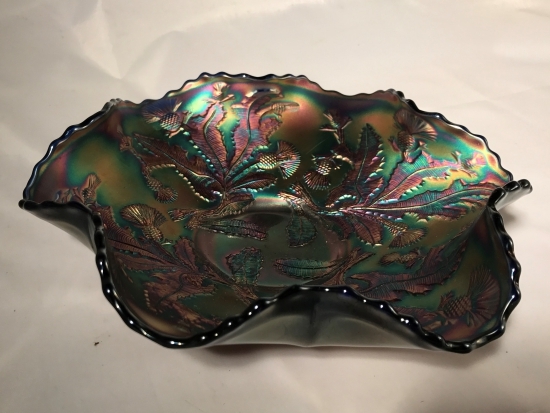 I was happy to find a piece of iridized Heisey glass to add to our collection. I’ll have some more “new” acquisitions to share next time.